The logical, self-evident conclusion of all the above is as follows: The agricultural community that the Arabs found in Eretz Israel in the 7th century was none other than the Hebrew farmers that remained on their land despite all the persecution and oppression of the Roman and Byzantine emperors. Some of them accepted Christianity, at least on the surface, but many held on to their ancestral faith and occasionally revolted against their Christian oppressors. After the Arab conquest, the Arabic language and Muslim religion spread gradually among the countrymen. In his essay "Ancient Names in Palestine and Syria in Our Times," Dr. George Kampmeyer proves, based on historico-linguistic analysis, that for a certain period of time, both Aramaic and Arabic were in use and only slowly did the former give way to the latter. The greater majority and main structures of the Muslim falahin in western Eretz Israel present to us one racial strand and a whole ethnic unit, and there is no doubt that much Jewish blood flows in their veins—the blood of those Jewish farmers, "lay persons," who chose in the travesty of times to abandon their faith in order to remain on their land. Ben-Gurion's theory may not withstand modern DNA analysis, but his essay reveals a genuine attempt to establish an ancestral kinship with the Arab population and to bridge cultural and religious divides. 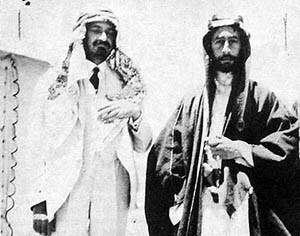 Chaim Weizmann (L), wearing Arab dress as a sign of friendship, and Emir Faisal I signed what became known as the Faisal Weizmann Agreement in 1919, which called for an Arab and a Jewish state to exist side-by-side. With heartfelt admiration and great interest we are viewing today the current war of liberation conducted by the ancient Arabic nation. We see how the scattered Arab forces are being united under the good will of Western governments and other peace-loving nations, and how, from the mist of war there emerge new and immense political possibilities. We see again the formation of a strong and united Arab political body, freshly renovated and aiming to renovate the great tradition of Arab science and literature that are so close to our heart. This kinship found its glorious expression particularly in the Spanish period of the Hebrew-Arabic development when our greatest authors wrote and thought in the Arabic language, as well as in Hebrew. If indeed there is among the Arabs a national movement, we must relate to it with the utmost seriousness ... The Arabs are concerned about two issues: 1. The Jews will soon come in their millions and conquer the country and chase out the Arabs ... Responsible Zionists never said and never wished such things. 2. There is no place in Eretz Israel for a large number of inhabitants. This is total ignorance. It is enough to notice what is happening now in Tunis, Tangier, and California to realize that there is a vast space here for a great work of many Jews, without touching even one Arab. In November 1930, about a year after the Arab riots that led to the Hebron massacre, Ben-Gurion addressed the First Congress of Hebrew Workers and delivered a lecture entitled "The Foreign Policy of the Hebrew Nation." In this lecture, later published in Ben-Gurion's first book, We and Our Neighbors, he not only acknowledged the national aspirations of the Palestinian Arabs but also recognized Arab self-determination as an inalienable right, regardless of its impact on the Zionist plan. In much the same way that we need to educate the Arab public to understand our interest, so also we need to educate our public to understand the Arabs and work toward decent neighborly relations ... mutual recognition is prerequisite to mutual understanding. The total Arab rejection of his overtures, followed by the bloody riots of 1936-39, eroded Ben-Gurion's confidence in achieving Arab understanding through education and cooperation. It remains an interesting exercise, though, to imagine what the Middle East would be like today had Arab leadership reciprocated with some recognition, however mild, of the Jewish right to self-determination. There is no point talking about the possibility that the Arabs in Eretz Israel would consent to the Zionist plan while we are a minority here. I express it with such confidence not because I enjoy disappointing decent people but, simply, to save them disappointments: All these decent people, except those blind from birth, have understood already that this is something that is utterly illogical—to obtain the Arabs' consent and goodwill to turn Eretz Israel from an Arabic country to a country with Jewish majority. Every indigenous people, regardless of whether it is primitive or advanced, views its country as a national home and aspires to be and remain its sole and eternal landlord; it does not voluntarily agree to accommodate, not only new landlords, but even new partners or new participants. And our most misleading argument would be if we rely on the fact that our agricultural settlements bring them economical advantages; though this is an undisputed truth, there is no nation in the world that sold its national aspirations for bread and butter. "The Zionists—so wrote the Arab editor—are tormenting their nerves unnecessarily. There is no misunderstanding here whatsoever. The Arabs never doubted that the potential absorption capacity of Eretz Israel is enormous and, therefore, that it is possible to settle here enough Jews without dispossessing or constraining even a single Arab. It is obvious that ‘this is all' the Zionists want. But it is also obvious that this is precisely what the Arabs do not want; for, then, the Jews will turn into a majority and, from the nature of things, a Jewish government will be established and the fate of the Arab minority will depend on Jewish good will; Jews know perfectly well what minority existence is like. There is no misunderstanding here whatsoever." Whoever thinks that our arguments [for Jewish immigration] are immoral, I would beg him to address the following question: If this [Jewish immigration] is immoral, what should the Jewish people do …? This sort of morality has a place among cannibals, not in the civilized world. The land belongs not to those who have too much land but to those who have none. If we appropriate one parcel of land from the owners of mega-estates and give it to an exiled nation—it is a just deed. New Historians often cite anecdotal and secondhand evidence or diary entries lacking in context that depict an exaggerated, hostile attitude of early Zionist leaders toward the Arabs. In contrast, the quotations cited above were articulated in prominent and open public forums and published widely for Hebrew readers in Palestine and the Diaspora. It is these quotations, therefore, that are true representations of the dominant attitude of the Yishuv, the pre-1948 Jewish community in Palestine. They were annunciated broadly with the aim of shaping public opinion, educational norms, and cultural molds, which no doubt contributed to the culture of accommodation that governs the Israeli mindset today. Judea Pearl is a professor at the University of California, Los Angeles, and president of the Daniel Pearl Foundation, named after his son. With his wife, Ruth, he co-edited, I Am Jewish: Personal Reflections Inspired by the Last Words of Daniel Pearl (Woodstock, Vt.: Jewish Light, 2004), winner of the National Jewish Book Award. "Leverur Motsa Ha'Falahim," Luach Achiezer, New York, 1917, pp. 118-27, reprinted in Anachnu U'Shcheneinu (Tel Aviv: Davar. 1931), pp. 13-25. Philadelphia: The Jewish Publication Society, 1892. Diana Muir, "A Land without a People for a People without a Land," Middle East Quarterly, Spring 2008, pp. 55-62. "Zechuyot Ha'Yehudim Ve'Zulatam B'Eretz Yisrael," reprinted in Anachnu U'Shcheneinu, p. 31. For more on Zangwill, see Muir, "A Land without a People." Chaim Weizmann, Devarim, vol. 1 (Tel Aviv: Mizpah Publishers, 1936), p. 99. Ha'aretz (Tel Aviv), Dec. 15, 1919, as reprinted in Devarim, vol. 1, p. 129. "Arviyey Eretz Yisrael," in Medina Ivrit (Tel Aviv: T. Kopp, 1937). Related Topics: Arab-Israel conflict & diplomacy, History | Judea Pearl | Fall 2008 MEQ receive the latest by email: subscribe to the free mef mailing list This text may be reposted or forwarded so long as it is presented as an integral whole with complete and accurate information provided about its author, date, place of publication, and original URL.